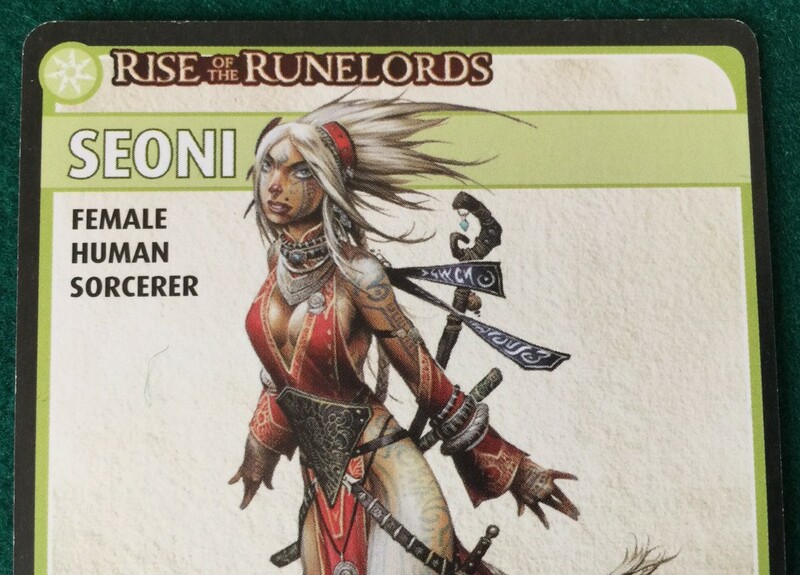 Seoni: Female, Human, Sorcerer. Nearly Dead. As you may remember, the gimmick with this game is that you build up your character over several sessions as you complete the adventures in each story, but if you mess up then your character can die and you have to start all over again. It is all about keeping enough cards in your deck so you can survive a bad turn. Seoni is exploring the corrupt city of Magnimar in search of Xanesha, the evil lamia villain. She is doing well, clearing out the Shadow Tower and Temple and she finally tracks down Xanesha in the Shrine to Lamashtu. Seoni confronts the villain in the shrine. 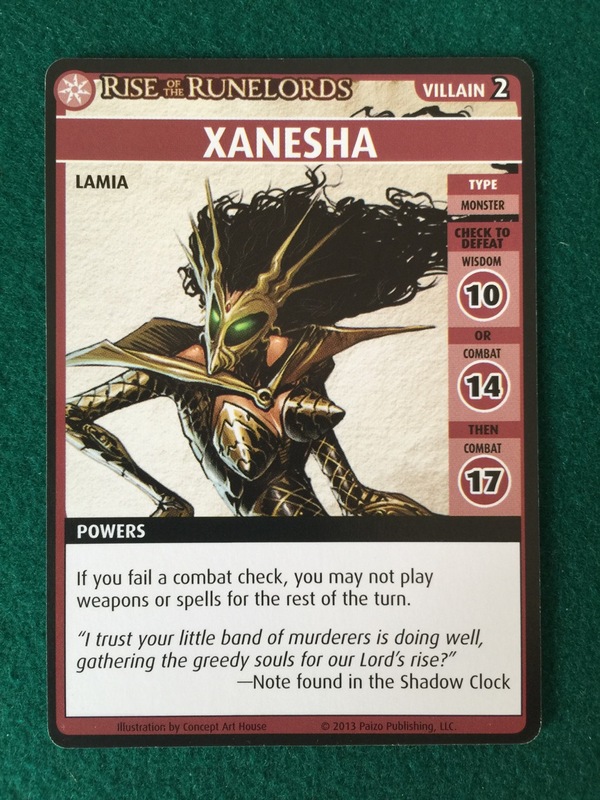 Xanesha is tough because she needs two combat checks to be defeated. For the first check you have to roll 14 and for the second 17. She also has a special power which means if you fail the first check then you can’t use any weapons or spells for the second check. And you always have to roll both checks. Xanesha is tough, but her special power is a killer. So is that breastplate. So, when Seoni first encountered Xanesha she fired off a lightning touch spell with help from her Acolyte ally. This was a roll of d12 + 3d4 + 4, which is an average of 17. She rolled 1, 1, 3 and 4, plus 4 for a total of 12. A terrible roll. This is 2 points short, so she took 2 damage. This was easily absorbed by her Wand of Shield but then, thanks to Xanesha’s ability, she can’t cast any spells for the second check. 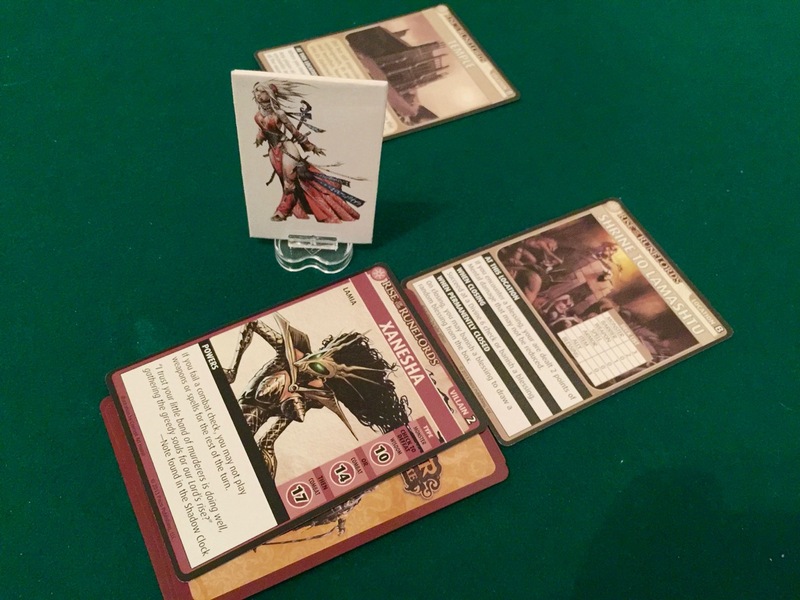 Wildly flailing with her bare fists is no use against a lamia wielding a pointy lance, and so Seoni took a huge amount of damage from the second combat check, wiping her out and forcing her to draw 6 cards to reset her hand. This left only 4 cards in her deck. She should probably have given up at this point and tried the adventure again from the beginning, which is always an option. Exploring again, she once more found Xanesha. She had a full hand of 6 cards and 4 in her deck. First, she fried the villain with a fire spell, rolling a total of 20 versus 14 and winning the first check. Then she used another fire spell with a blessing for the check of 17 and rolled a massive total of 26! This easily defeated Xanesha and won the game. Woo-hoo! Seoni has saved the city and can count up her loot! This all seemed very straightforward, and was how most of the combats throughout Seoni’s solo career had gone. Big spells with big rolls blasting enemies to bits. The thing is, I hadn’t realised how dangerous this final battle had been. The first check was safe. Even if she rolled very badly, she couldn’t die. The lowest she could roll was 8. She would take 6 damage (14 minus 8), but even then she could discard a protective medallion to stop 4 of it, leaving her 2 cards in hand. She would still survive the reset at the end of the turn. This is why I had blithely continued the game after her first bad encounter with Xanesha. It looked like she could survive. The thing is, (and this is what I had forgotten), if Seoni did lose the first roll, then Xanesha’s ability would mean that for the second check she would once again be fending off a magic spear with her bare hands. She would be guaranteed to lose by a huge amount, discard all her cards and have to draw 6 cards with only 4 left. This would have killed her. Next up, Seoni will run through the first couple of adventures in the third add-on pack, where she is fighting ogres and giants.